36 "X 48" X 2"
The process of life and death is an infinite cycle. When we enter this dimension here on Earth, we bring with us certain guides and power sources to assist us on our journey. Also those Angels, Spirits of the Stars, Higher Selves can come to us in the form of a human baby. Oh the stories about God... they will tell! The children are our teachers. The Bird Tribe Beings are Spiritual guardians of the Earth; Angelic Beings come here to assist us in our awakening into the higher consciousness we have forgotten. These Angels or Spirits of the Stars, can come to us in the form of a human baby. The Story: When I began Bird Tribe Child, I was playing with color on my canvas outside on a warm sunny day. I Prayed for Spirit to use me, to paint through me as I burned Frankincense and used the sacred essence in the paint on the canvas. This brings Holiness to the Spirit of the painting. A fetus had shown up in my painting “Rainbow Blesser”, a few months earlier and here I saw a fetus again. As I was meditating with the images on the canvas, I asked myself, “Is that a bird?” Just as the words crossed my thoughts a Red Tail Hawk swooped down from above me, low, just over my head. I could feel his Spirit in the wind off his wings and in that moment I knew beyond a doubt, this was a Bird Tribe baby I was painting. 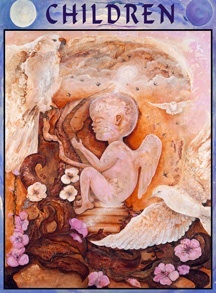 In the painting, the baby sits on the stairway of consciousness, the umbilical cord still attached to her Mother Creator. The white Hawk and Owl are her protectors, guides and messengers and the visionaries of the air. The white Dove is also an oracle and God’s messenger and bringer of peace in the maternal world of the feminine uniting at this time. The Hummingbird brings iridescent color and joy as her guide into the world of the Devas and Faeries, connecting her with the doorway to the spirits of the Earth. The Swallows are the way-showers home. There are many names for us. We have been called angels, Bird Tribes, higher selves, hoksedas, spirits of the stars. The reality of what we are is more than a name can convey. We are the multiple projections of the Eternal One, spirits designed to blend with present day humans. You now consider yourselves to be your egos, but the egos are only half of the human equation. The complete human is a spirit/ ego partnership. When a child is present in our life we can ask the angel. “Why did you come to earth?” and, “What is the gift you are bringing?” Let the angel speak. It doesn’t have to be in words, she can speak through feelings. Let her know we have received the answer and ask: “What is the highest thing I can do for you? How can I best support you in your mission?” Let the angel-child tell us, in words or in feelings. Heart to heart. Often, the thing the child needs from us most is the thing we too need. The character trait or energy that is needed most to support the child. It is often exactly what we on a soul level wish to develop for our selves. Children are the greatest source of reflection for our lives. Any struggle we find our self in with our children is there for a reason. Not only do they reflect our strengths, but they are also a reflection of the work we still need to do on ourselves. Take the time for healing the hurt inner child inside, this is a big part of the work. The medicine in this painting is reminding us to help the Children remember who they are. Help them realize that their high sensitivity and idealism belong to the most beautiful qualities they possess. Let them articulate and express themselves and encourage them to find out how these qualities enrich and contribute to the world. Find creative ways of expressing their sensitivity so that they can experience joy in it. Bring them together and let them exchange experiences and share their energies. Appeal to their gifts and talents and, as much as possible, let them find their own answers and solutions. Encourage them to express their passion and inspiration and manifest their inspirational energy on earth in a practical way. This may be a creative form such as painting or making music, or it can be through sports or games. What matters is that they know how to ground their energy and make it visible to others. In that way they channel their energy to earth. In all of these things, the starting point should be that they enjoy expressing themselves in material form. Important to remember this honouring of the “child” also includes the child inside us. We all have inner children who are looking for these same types of interaction with us as the adults. Jesus said, “Let the little children come forth.” No child is left behind. We must play with, honour and recognize our children for who they truly are our future.